Bovec was the northwestern Slovenian town of 1600 people where we dealt with my immobilizing rear hub problem. 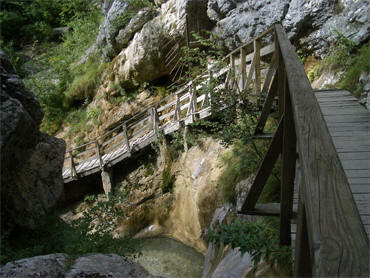 At the base of the Julian Alps and at the confluence of 2 mountain rivers, it is a hotbed of modern outdoor sports. The hype around the adrenaline sports in Bovec was reminiscent of New Zealand with the seemingly dozens of little ventures ready to haul people out to one of rivers and slosh them downstream in a rubber raft or mini-kayak. And this part of the narrow Soča Valley had its own airfield for gliders being hauled up by planes and a ski lift to haul the paragliders up to the cliffs they needed for their form of flight. Being in Bovec made it easy to believe that the Slovenes are avid outdoor enthusiasts, to the point of regularly claiming more Olympic gold medals per capita than the US or Russia. Though no doubt some other nationalities would challenge the Slovene's assertion that they invented skiing about 400 years ago. But it was just down the valley road from buzzing Bovec that a museum told another story of extreme experiences in these mountains. It was in the next valley town of Kobarid that what is considered one of the greatest military campaigns ever fought in mountainous terrain is documented. The nearby mountain top location of the Soča or Isonzo Front was yet another of the many long stand-offs of entrenched fighting in the Great War, this time between the Italians and the Austro-Hungarians. The stalemate had gone on for 2 and a half years when the Germans were concerned that Italians would soon make a breakthrough. The Germans decided in October of 1917 that it was time to lend support to their Austro-Hungarian allies. The resulting rout above Kobarid is better known by the Italian name for the town, which is Caporetto. With the arrival of the Germans at this front came a change in the control of the battle as until then, all of the decision-making was retained by the distant high command of both the Italian and the Austro-Hungarian troops. The Germans were experimenting with pushing the decision-making lower down the chain of command, which dramatically tipped the balance of power to their side in this instance. The Germans were also pioneering an early form of their surprise tactics that were so successful in WWII, the blitzkrieg. Additionally, it was at this battle for Caporetto that the Central Powers had an unusually effective use of poisonous gas against the Italians--an instance where the perpetrating troops weren't wiped-out as well. The body count skyrocketed with the break-through in the stalemate that came with the German collaboration. On the Isonzo Front alone, the Italians sustained 500,000 casualties and lost another 300,000 men as POWs. The success of this Axis Powers' surge was so unexpected by them that they were unable to fully capitalize on their success as they lacked the plans or the support needed to maximize their advance as the beleaguered Italians retreated. Kobarid's museum to this significant WWI battle was like many war museums we'd seen before with uniforms, artifacts, memorabilia, maps, and photos. For me, this only mildly-interesting subject was made more significant because of the other mountain top, WWI battle site we'd recently visited on the border between Italy and Austria. The telling of yet another story deepened my understanding of WWI, especially as to how it was fought in the mountains. This exhibit again highlighted the difficulty I'd had in keeping the players straight in Eastern European history. The "we" and the "they" just isn't as familiar as in Western Europe. In Slovenia at this time, the "we" included Austro-Hungary and Germany. A few years later, on the same bit of land, the "we" would instead include Italy. The moving borders, changing alliances, and land grabs kept me consulting with Bill to keep the players straight as he is better versed in war history . Seeing Ernst Hemmingway's smiling photo above a doorway raised another "who" question for me at the Kobarid museum. We were soon reading that young Hemingway joined the war effort in Italy as an ambulance driver for the Red Cross in 1918 but wrote his Farewell To Arms based on this earlier battle above Kobarid in 1917. We saw his book in both English and German and planned to buy it in the Italian and English editions as everything else in the museum bookshop was in those 3 languages, plus Slovenian. We had thought it a clever way to advance our Italian skills by having a handy translation in the form of the English version of the book rather than looking up so many words in a dictionary. And our interest in the book would be piqued because we'd be reading about a place we'd been, a story we'd first learned about at the museum. But our challenging Italian exercise was thwarted as there was no slot for the Italian version on the bookrack. There was no flat land for foundations at Franja. We left Kobarid quite satisfied: we'd advanced our understanding of Slovenian and Eastern European history a bit, we had a plan to advance our Italian and Bill's German language skills, and we'd have the bonus of reading a bit of missed classical literature. But little did I know that it wouldn't be long until my Slovenian "we-they" knowledge would be challenged again as we visited another historical site--this time from WWII. "Hummm, hospital....I wonder why Bill is bothering with a detour to a WWII hospital?" Over our years of traveling abroad, we'd seen our share of meager medical suites and kits including evidence of Neolithic skull drilling, Roman surgical tools, on up to 20th century improvements. They were exhibits, but none yet had warranted more than a few quick glances let alone a detour into the hills. But there is a reason I jokingly say "Just point and I'll pedal" as Bill spends hours sifting through the guide books and tourist literature to craft our routes. The Slovenian hospital proved to be worth the effort despite his flagging commitment to it that had resulted in his spare marketing efforts. 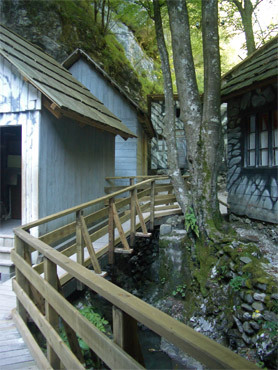 The reconstructed Franja Partisan Hospital was 1 of about 120 covert care centers usually hidden in the forests and caves of Slovenia during WWII. Depending on the source, collectively they cared for between 10,000 and 15,000 soldiers. Almost all of the partisan care facilities were in single cabins or clusters of 1 or 2 room wooden cabins. The patients & staff waded--this was built for the tourists. The deep forests usually had ample water supplies but no roads running through them. The lack of roads decreased the odds of detection of the hospitals by the enemy, but made them very difficult to access, both for delivering supplies and delivering the wounded. These forest centers also could not burn fires during the day because of the risk of discovery and could not be defended if exposed. Once the Slovenian partisan fighting increased in 1942 and 1943, the benefits of a particular little gorge as a hospital site were recognized. The gorge was only a few miles from Cerkno, the unofficial capital of the the partisans, and the nearby main road and cart track would speed-up the delivery of wounded to the hospital. And unlike the customary forest facilities, it could both be better hidden and better defended. 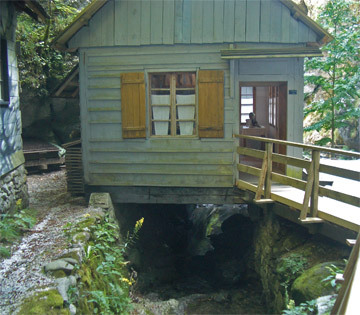 A single cabin was built straddling the stream in the deep gorge and Franja Partisan Hospital received its first wounded partisan soldiers in December of 1943. Roads went close to the gorge and the traffic was split to decrease the chances of drawing unwelcome attention. From one route, local farmers and partisan groups lowered provisions down the steep cliffs by rope to maintain secrecy. Patients and some supplies were carried up the gorge stream itself as a second route so as to leave no traces of occupancy. What a feat to stumble along an icy streambed at night carrying a stretcher or guiding a wounded soldier who was blindfolded. The gorge stream ran under most of the cabins. In the hospital's early days a visiting partisan commander appreciated the benefits of the hospital being in a deep, abruptly dead-ended sliver of a gorge and ordered that Franja's facilities be expanded. Having a field hospital that wouldn't have to be evacuated during an encroaching battle would be a potent asset for the planned spring offensive. The entrance to the gorge looked as unremarkable as any other of the hundreds of steep little valleys in the area and the many natural caves in the walls of the gorge provided places for stashing supplies, guards, and extra patients when needed. And the convolutions in the cliff faces and overhangs made it difficult to detect the wooden buildings from above. In addition to its hidden location, the noisy waterfalls on both sides of the hospital dampened noise from talking and occasional festivities. Somehow, the walls of the gorge also managed to dissipate the smoke from fires, so the staff and patients had the luxury of hot meals during the day as well as some heat, unlike their counterparts in the forests. Franja was established in the gorge as it offered a unique opportunity for the partisans to hold their position if discovered and attacked. Its physical location made it defensible and the natural features were augmented by landmine fields, machine gun nests, and guard positions in which the staff had to be raised and lowered by rope. The patient care facilities grew rapidly to its maximum of 13 cabins. They eventually built a water-powered electrical generator at the high end of the ample stream to improve the available services. The hospital treated and housed over 120 patients at a time and in its brief history, served over 500 wounded. This compound was the nucleus of an operation that cared for over a 1000 wounded, many of the less severely injured being in remote satellite units. Franja began as a long term care facility for the severely wounded but by the end of the war the staff was able to perform some surgeries and even had what looked like a stand-up, real-time X-ray machine that was air dropped by the Allies. It was such a reliable location that it became a hub for Allied air drops of medical supplies for it and other partisan hospitals. Most of the patients at Franja were members of the Yugoslav or Slovenian partisan army, with 2 Americans being among the others cared for during the war. The Nazi's bombed the area twice, and though evacuated twice during its existence between 1943-45, the hospital was never fully discovered and no wounded soldiers were ever captured. Several medical staff however we killed during the 2 enemy attacks. The Yugoslav Partisans were considered the best organized and most successful of the WWII resistance movements and the Franja Hospital operation was a convincing testament to that claim. Like with the WWI stories up in the Italian/Austrian mountains, keeping the players straight in the Slovenian museums was a challenge for me. Those "we" and "they" comments sometimes left me guessing. The Italians were definitely the enemy at the time of Franja's existence as they'd made a successful grab for this western part of the Slovenes homeland at the end of WWI--a grab that was ratified by a treaty in 1920. Then, early in WWII, they extended their reach as far east into Slovenia as the current capital of Ljubljana. This increasingly harsh presence of fascist Italy triggered the domestic liberation movement to became more active in Slovenia early in the war. Most of the wounded partisans in the early days of WWII were cared for on the sly by sympathetic Slovenian medical staff in areas held by Italy. Additionally, cooperative medical personnel siphoned off supplies from hospitals in the occupied territory to support the partisans. By mid-1942, the partisans had liberated significant sections of Slovenia and began creating a rudimentary infrastructure including courts and social and medical services. Some of Franja's orthopedic inventory. 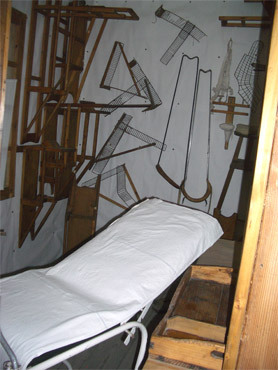 Even in these politically improving times during the war, medical services were still delivered secretly in clandestine forest cabins and underground shelters. The support services already put in place picked up speed when Italy surrendered in September of 1943. In their retreat, the Italians left behind medical supplies that served as starter-kits for new Slovene field hospitals. An additional boost to the partisan hospitals was made by the Slovenian medical staff released from Italian concentration camps after Italy capitulated--many who joined the liberation cause. But it was only weeks after Italy's withdrawal from the area before the Germans began filling the vacuum left by the fleeing Italians and the German forces established strongholds in the briefly and somewhat liberated Slovenia. The Slovenian momentum for having a more open medical service had to again be redirected into underground operations such as Franja. The head-scratcher for me at the Franja Hospital was the Italian presence. Almost all of the physician's notes and some of the thank-you's from family members were in Italian. In addition, the second largest group of patients at the highly secret Slovenian partisan hospital, after Slovenes, were Italians--the enemy. The last page in a little book we bought in the next town finally had the answers. It was the Italian, anti-fascists division in Yugoslavia's partisan army that generated the Italian patients and subsequent letters of gratitude. And presumably the medical notes were in Italian because most of the staff had been trained during the Italian occupation of Slovenia and Slovene was an outlawed language. We'd left Franja Partisan Hospital with more questions than answers and felt very lucky when we found a booklet in the museum of another town than filled in some big gaps in the story. That experience was yet another reminder as to how much of one's satisfaction when traveling is the result of chance events, regardless of the level of planning. And it was in this same Cerkno/Franja area that one tourist opportunity got away from us, which was visiting the 1995 discovery site of a Neanderthal bone flute. We learned that we were near the Divje Babe cave where the flute was found but, not surprisingly, the cave wasn't in easy biking range. We pondered whether to make the extra effort required to see the site and decided against it. In previous years we'd already been to the museum where it was housed and either saw it or a replica of the inches-long flute dated to 45,000-82,000 years ago. We decided that the cave where it was found probably wouldn't be much different than other prehistoric caves we'd seen. Luckily, a few days later, a regional museum had yet another replica and a demonstration video on how the flute might have been made so missing the cave felt even less important. Risk management is an ongoing, secondary topic for us as travelers, a topic that rises to the surface more frequently when we cross the line into or beyond the old Eastern Block countries. "To go or not go" to the small city of Idrija revolved around the issue of mercury contamination. We used our electronic encyclopedia to brush up on our heavy metal chemistry and weighed the sight-seeing "pro's" against the long term health "con's". We were reminded that being liquid at room temperature is what makes mercury both so dangerous and commercially so special. Intriguing Idrija is the site of one of a handful of large mercury mines in the world, it being second only to a site in Spain. It produced 13% of the world's marketed mercury during its more than 500 years in operation. It ceased to be profitable in the 1970's when health and environmental issues eroded the metal's market price; the mine was finally decommissioned in the the 1990's. We'd seen several salt and coal mines and even a flint mine, but had to admit that a mercury mine would be different. Our guide book was unabashedly enthusiastic about what sounded like open (and therefore toxic) exhibits of mercury in the museum and additionally, it recommended a visit to the old mine itself where free beads of mercury were clinging to the walls. We'd learned that our guide books were quite helpful in knowing what parts of town to avoid after dark, but had found their expertise about more subtle health issues to be wildly deficient. Being acutely aware that US standards of consumer safety are not the norm in Europe, especially in Eastern Europe, we pondered if visitor safety was a high enough priority at these Idrija tourist sites. The memories were still too fresh from seeing an engaging fountain spewing mercury in a Barcelona museum a couple of years ago--an exhibit that we physically distanced ourselves from as soon as we understood what it was. Somewhat reassured by seeing that the Idrija museum had received an EU award in 1997, we decided to detour to the city and its museum. Once there, we'd cautiously assess the situation at the mine before committing to a visit. Visiting the mine itself turned out to be the high point of our Idrija detour as our extremely knowledgeable young guide was a straight-shooter, unlike the guide at the museum. The youthful museum guide had said "Of course it is all safe now, just look at me." We had been looking at him and decided he didn't look all that healthy even before he made the comment. But the guide at the mine itself didn't rely on personal testimonials. There he explained the impressive mine ventilation system that we could feel ourselves and we were pleased to hear that the mine's air quality was continuously monitored. And while in the mine we'd noticed that most of the rock walls were faced with a barrier material, including clear plastic sheets over the free beads of mercury shimmering on the rock surface. The stories told at the museum and at the mine about the past were a fright however, reminding us that it wasn't silly to be concerned. Early miners would die from toxicity in less than 10 years of work; later they usually survived until their early 40's. 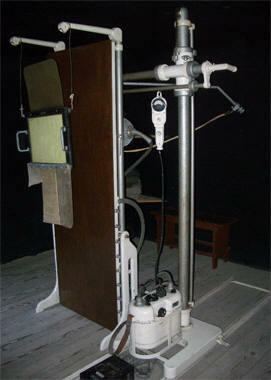 Advancing technology increased the range of their illnesses from simple mercury poisoning to silicosis of the lungs due to the fine rock powder created by the automated equipment. And what wasn't known until after the mine operations ceased was that they all would have died from radon exposure if the mercury and its byproducts hadn't done the job first. Amazingly, about 30% of the mercury taken from this mine was free-flowing, liquid beads of mercury--the discovery of which in 1490 about 3' underground lead to the beginning of the mining industry. The remainder of the mercury was extracted from cinnabar ore. In the early days, the bright red cinnabar contained about 50% mercury and seams could be traced visually by the miners. As the quality of the remaining ore decreased, it eventually contained less than 1% mercury. As operations shifted to mining poorer quality ore, core samples from potential seams evaluated chemically in the lab replaced on-the-spot assessment by the miners themselves. Much to our relief, our exceptional mine guide also minimized the fairytales that we usually endure on these mine visits and instead shared what was in the hearts of the miners that lead to the often tiresome tales. Our guide commented that the miners really did believe that an elf-like creature inhabited the mine and that as a sign of respect, they would often leave a bit of food for him. It was their way of acknowledging that they were intruding on the territory of another being and showing some humility in hopes of some consideration in return. He also commented that part of the fervent tradition of praying in the mine chapel before descending to the working levels was the fear of dying deep in the mine. It wasn't the dying that was so bad, but it was dying closer to hell that was the risky business. The miners were concerned that they wouldn't make it to heaven if they were too far from the surface of the earth. The Slovenes generally strike us as being a notch above the pack and their early, aggressive forestry management system designed to keep the mining industry in timber seemed centuries ahead of its time. Black Forest mine, glass, and timber industries vanished because of deforestation, which is an often-told story in Europe. But the Slovenes made their forests a renewable resource shortly after the mining industry took off in the 1500's. In keeping with that awareness, we also read that Slovenia established the first national forest in Europe, which was a little more than 100 years ago. 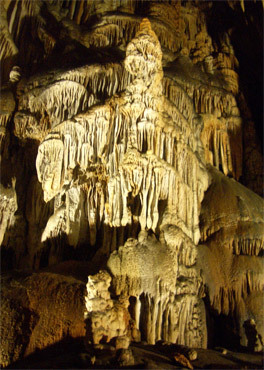 After Idrija, we had one more tourist site to see in Slovenia, which was Postojna Cave. Much of western Slovenia is a karst plateau of limestone in which the process of erosion has created fissures, sinkholes, underground streams, and caverns. The plateau is an old seabed of marine animal shells that was uplifted and then transformed by water percolating through the soil that had become mildly acidic in its downward journey. It was this carbonic acid chemical erosion process that produced hundreds of miles of caverns in the country, some with spectacular stalagmites, stalactites, curtains, and other formations. Our guide book was correct in that Postojna Cave was over-priced and overly touristy. And despite suffering those insults, no-photos were allowed to remember the experience. But we did enjoy the chance to again see the astounding products of one of nature's many slow processes. And at least at this cave the managers resisted the temptation that overwhelmed some Czech Republic cave operators, which was to 'enhance' the experience with multi-colored lights..
From Postojna we'd make our dash to the Croatia border for our 4th visit to that country, though once again covering mostly different territory than before. We and our bikes, left Dubrovnik, Croatia at 11pm on October 2 and at 8am the next morning our ferry docked in Bari, Italy on that country's east coast. We are currently working our way around the southern "boot" of Italy, which is all new territory for us. Bill reports that by the time we push off from the western, mainland at the port of Reggio di Calabria to go to Messina, Sicily, we will have almost biked around the entire perimeter of Italy in our 7 years of cyclotouring (as well as zigzagged across much of the interior). Sicily will be our last biking destination for 2007. We may linger in Germany a week or so before flying home to visit a German couple we met n Spain a few years ago. At last, we are enjoying some of the best summer weather we've had all year.